P.R. 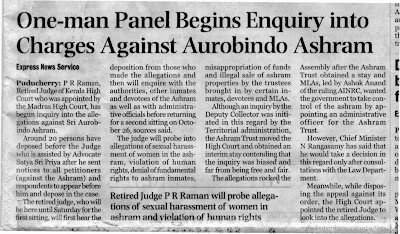 Raman, Retired Judge of Kerala High Court who was appointed by the Madras High Court, has begun enquiry into the allegations against Sri Aurobindo Ashram. Around 20 persons have deposed before the Judge who is assisted by Advocate Satya Priya after he sent notices to all petitioners (against the Ashram) and respondents to appear before him and depose in the case. The retired Judge, who will be here until Saturday for the first sitting, will first hear the deposition from those who made the allegations and then will enquire with the authorities, other inmates and devotees of the Ashram as well as with administrative officials before returning for a second sitting on October 26, sources said. 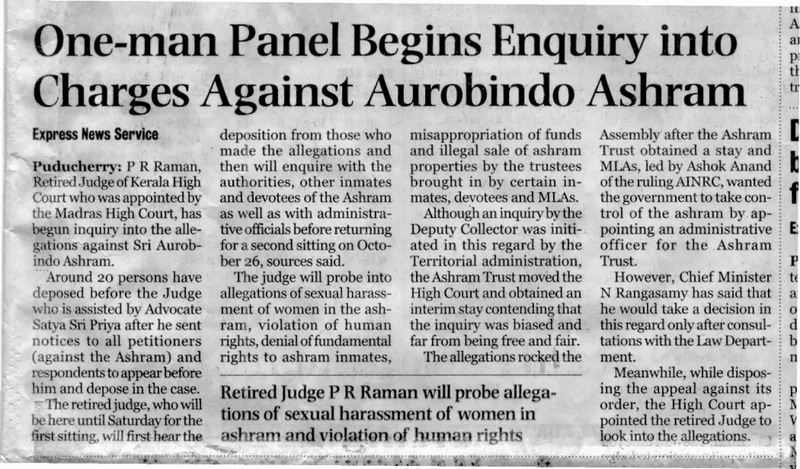 The judge will probe into allegations of sexual harassment of women in the ashram, violation of human rights, denial of fundamental rights to ashram inmates, misappropriation of funds and illegal sale of ashram properties by the trustees brought in by certain inmates, devotees and MLAs. Although an inquiry by the Deputy Collector was initiated in this regard by the Territorial administration, the Ashram Trust moved the High Court and obtained an interim stay contending that the inquiry was biased and far from being free and fair. The allegations rocked the Assembly after the Ashram Trust obtained a stay and MLAs, led by Ashok Anand of the ruling AINRC, wanted the government to take control of the ashram by appointing an administrative officer for the Ashram Trust. However, Chief Minister N. Rangasamy has said that he would take a decision in this regard only after consultations with the Law Department. Meanwhile, while disposing the appeal against its order, the High Court appointed the retired Judge to look into the allegations.